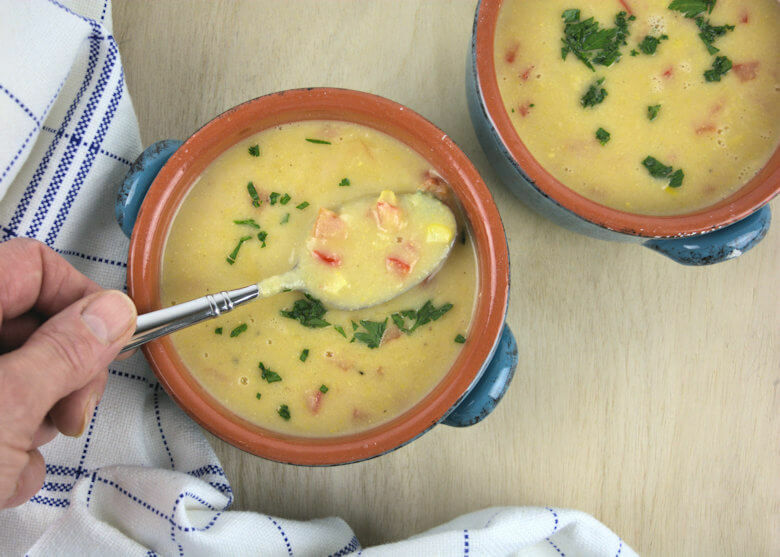 Summer time means fresh corn and this Sweet Summer Corn Soup is a wonderful way of enjoying all that corn. Check the corn for freshness before you add it to you shopping cart; it makes all the difference. Growing up in Holland, corn is not extremely popular and fresh succulent corn on the cob is hard to find. Most likely, the reason is that the Dutch climate is not ideal for growing corn. My first experience with a really good corn on the cob was here, on the other side of the Atlantic, the US side, on one of my many business trips, year and years ago. 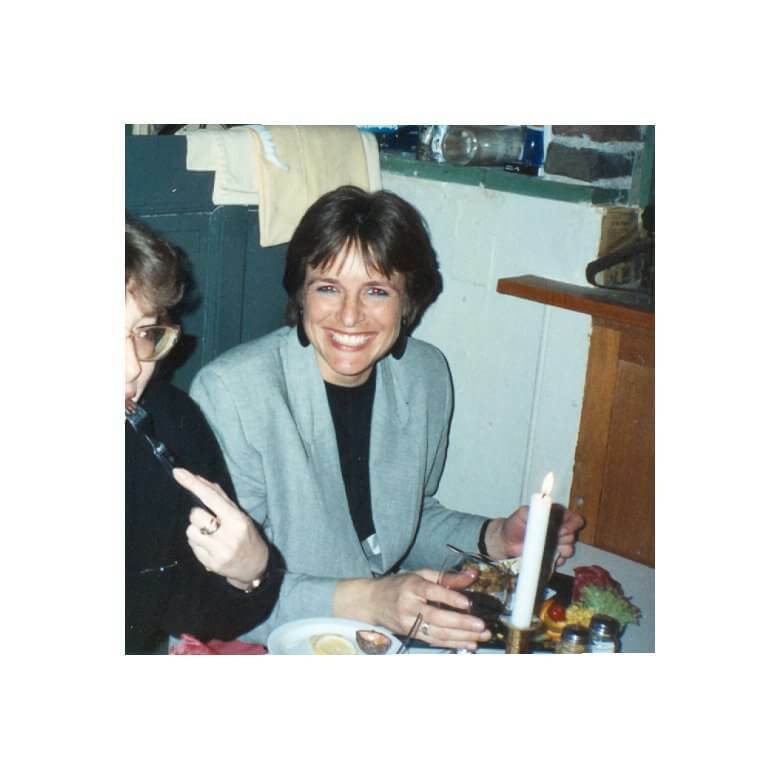 I remember, coming home from that trip, I bought corn in a Dutch supermarket, as I wanted to taste it again, but it was not a good experience. Since I moved here, I am enjoying fresh corn as much as I can and this soup is one way of doing that. 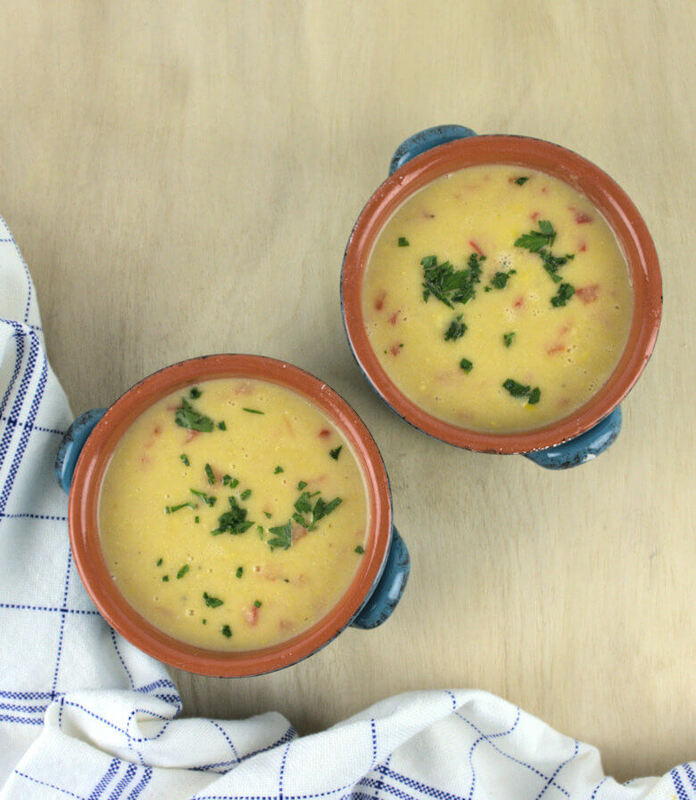 My Sweet Summer Corn Soup is not a chowder, it is a smooth soup with just a few kernels and pieces of red bell pepper added at the end to add some crunch and texture to the otherwise smooth soup. This is also a quick recipe, provided that you have fresh corn; you can make this soup for 2 in 30 minutes. Let’s cook and you’ll be done in half an hour, I promise. Cut a sweet onion in half and chop it, and transfer this to a large pot in which you melted some butter. Cook until soft and translucent, about 5-7 minutes. While this cooks, you can clean the corn. I usually clean the corn by cutting the bottom of the ear, then hold the ear by the top, the silks, and ‘squeeze’ the ear out of the husk from top to bottom. You’ll end up with clean ears 🙂 and the husks and silks will be left behind. If you prefer to do it in an other way, by all means. Next step is to cut the kernels off the cob. Place the cob on the cut side and cut along the cob, downwards, starting at the top, cutting the corn kernels off from the cob. Transfer the corn to the pot, keep about 1/4 cup aside, also add 1/2 a peeled and cubed potato, the vegetable stock and the water. Cook for about 15 minutes until the corn is soft. Puree the mixture with an immersion mixer or transfer to a blender. At this stage you’ll have a nice smooth soup. Now it need some texture; add the corn you set aside as well as half a red bell pepper that you finely chopped. Also add just 1/4 cup of cream to give the soup a velvety base. Allow to cook for just 1 minute, so the corn and bell pepper remain crunchy, without being raw. Add salt and pepper if needed. That’s all and the result is really nice, if I may say so myself. 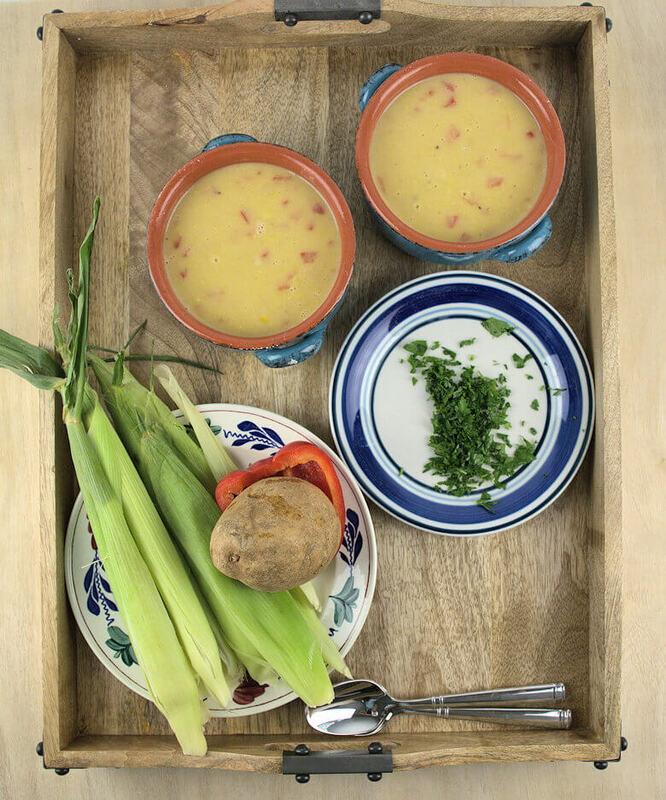 Divide the Sweet Summer Corn Soup over 2 bowls and sprinkle with parsley. Melt the butter in a large pot and add the onion. Cook until soft and translucent, about 5-7 minutes. Clean the corn by cutting the bottom of the ear. Hold the ear from the top and squeeze ear of corn out of the husk from top to bottom. Husks and silk will be left behind. Then place the ear, cut side down and use a sharp knife to cut the corn off the cob. Start at the top and cut downward with a gentle sawing motion, cutting the corn kernels off from the cob. Continue cutting until all of the kernels are removed. Fill 1/4 cup with corn kernels and set aside. Transfer rest to the pot, as well as the potato, the vegetable stock and the water. Cook for about 15 minutes until the corn is soft. Puree the mixture in a blender or use an immersion mixer. Add the cream, reserved corn, bell pepper and salt and pepper to taste and cook for 1 minute.